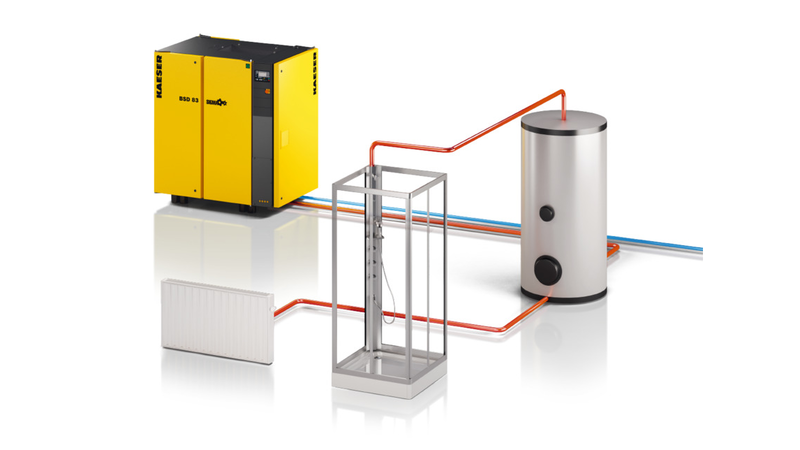 A rotary screw compressor converts 100 % of the drawn electrical energy into heat. Up to 96 % of this energy can be recovered and reused for other purposes. The fully enclosed design of modern rotary screw compressors makes them especially suitable for heat recovery. This fact applies to both fluid-injected as well as to dry compression compressors. Using recyclable heat from the compressor and quality heat exchangers, heat recovery systems can heat water to 70 °C (higher temperatures are possible upon request) and you can recover up to 76 % of the heat energy. The resulting heated water can then be used in production, in your heating system or as service water. Rotary screw compressors from the SM series (from 5.5 kW) upwards can be equipped with PTG systems. Depending on the size of the compressor system, the PTG heat exchanger is either integrated within the unit or is installed externally. In water-cooled systems, integrated plate or tube-type heat exchangers are available, depending on the available water quality.